In December 2016 I met with Professor Jan Haaken, filmmaker, feminist and clinical psychologist, in London. I invited Jan to take me on a walk from a place she calls home to a special place. We were joined by Nelli Stavropoulou a filmmaker and PhD student. Jan and I had first met some years before when we were both keynotes at a conference that focused upon visual methods. We kept in touch and Jan later joined my department as a Fulbright Scholar and together we conducted participatory arts-based research with asylum seeking women in 2011-2012, using walking, photography and filmic methods. Working at the borders of disciplines, Jan’s feminist, participatory, collaborative and filmic work is inspiring. Fig.1. Jan Haaken. Images: Friderike Heuer. 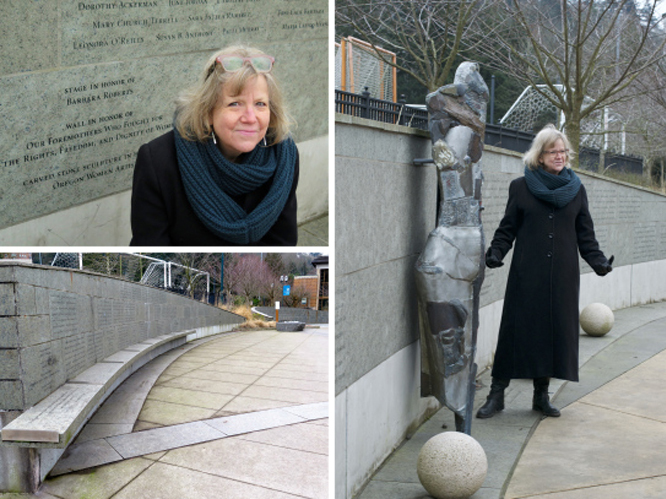 Jan’s special place was a walk that she had developed with colleagues in Portland at the campus of Portland State University, just a block away from her office. The walk in Portland was to honour inspiring women and to be a space of diversity, stillness and reflection. 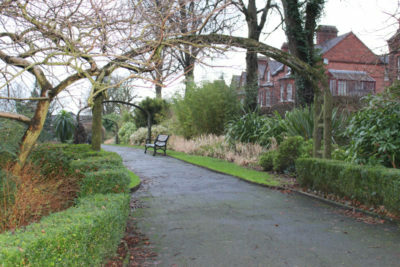 The Portland walk was called The Walk of the Heroines. I bought this idea to the university years ago and worked with my colleagues to make it a reality as a creative claim on cultural space and public memory–to remember how women have changed the course of history and hold things together in unacknowledged ways. We could talk about how the urban landscape both holds and represses memory of marginalized peoples. Feminists Walking the City invites viewers on a journey with Jan Haaken through London’s streets, tracing the walk she developed in Portland Oregon, to honour women throughout history, by searching for and mapping the city’s heroines. 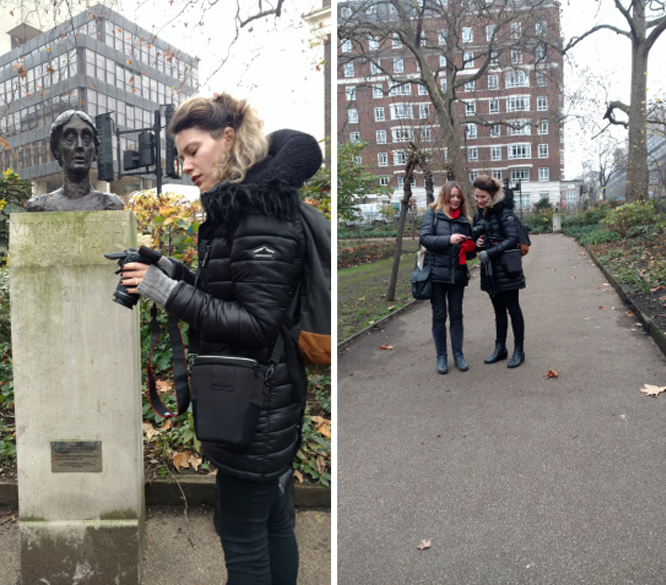 Beginning in Tavistock Square with Virginia Woolf and closing with the monument to Emmaline Pankhurst in Victoria Tower Gardens, near the houses of parliament – and we find so few! Along the way, we learn that no memorial to Mary Wollstonecraft exists anywhere in the city! 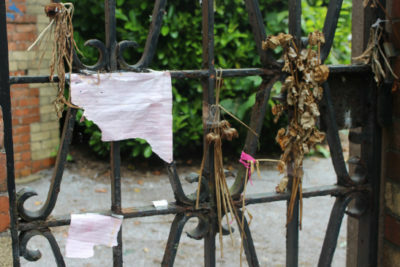 We dedicate this walk to the Mary on the Green campaign for the creation of a memorial to Mary Wollstonecraft. Jan it’s such a pleasure to have you here in London, I’m really looking forward to the walk that you’re going to take me on as part of the Leverhulme Fellowship Project, Methods on the Move, Experiencing and Imagining Borders, Risk and Belonging. 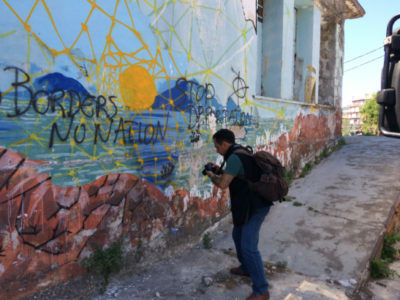 So as you know the research is undertaken by inviting participants, academics, artists, who have agreed to be involved, to walk with me around a route of their choice connected to their pioneering work on borders, risk and belonging. So could you tell me about the walk that you have chosen, about the route you have chosen, why this walk? Filmed by Nelli Stavropoulou, directed by Jan Haaken and Maggie O’Neill the documentary combines archival footage, walking methods and new forms of cinematic storytelling. Fig.3. Nelli and Maggie. Images: Jan Haaken. Feminist walking in the city connects with a project I participated in earlier in the year at WALKING WOMEN a weekend of events on walking and art that took place over a weekend at Somerset House, London, curated by Amy Sharrocks and Clare Qualmann in collaboration with Dee Heddon. During the weekend I shared a film produced with Jan Haaken in 2012 ‘Searching for Asylum’ where we walked with women seeking asylum in Teesside, and a walk I conducted as part of the Leverhulme Fellowship with Faye from a direct access hostel to a special place in the city. As part of the Walking Women weekend of events, Dee Heddon led a Walking Library for Women Walking on a suffragette inspired route stopping at monuments and places to read excerpts from the walking library books that Dee & Blake Morris carried with them along the route. A Study Room Guide on women using walking in their practice is compiled & written by Amy Sharrocks and Clare Qualmann and published in 2017 by the Live Art Development Agency. See also the lovely travel book by Bee Rowlatt In Search of Mary: The Mother of all Journeys that follows in the footsteps of Mary Wollstonecraft in her Letters Written During a Short Residence in Sweden, Norway and Denmark (1796).